Student checking physical parameters at the Boulder Spring thermal site. During the first 5 years of this project (1998-2002), research objectives were two-fold: (1) To isolate and describe DNA segments (specifically 16S genes) from Yellowstone red layer communities; and (2) to perform extensive surveys throughout Yellowstone for red layer communities. Two hypotheses were tested and ultimately supported during this period: (1) That red filamentous bacteria are a new member of the Chloroflexi phylum, and (2) that these new Chloroflexi bacteria are more widely distributed in Yellowstone than previously thought. During the first phase of this project nearly 150 new bacterial DNA sequences (16S ribosomal genes) from ten hot spring communities in Yellowstone National Park and Eastern Oregon have been described and compared. Most of these new sequences represent novel "red" green nonsulfur (GNS) phototrophs, an evolutionarily ancient group of diverse bacteria. Site-specific clustering among red GNS isolates suggests that variable site feature(s) that are yet to be elucidated may drive selection of red GNS variants. Some interesting surprises: the red filaments are most similar to a new genus of Japanese bacteria called Roseflexus, discovered in 2002. We were also extremely surprised at how diverse the red bacteria were in Yellowstone, leading to two new hypotheses being tested at this time: First, that site-specific red Chloroflexi variants are selected by unique environmental conditions (physical, temperature, and/or pH) at a given site. 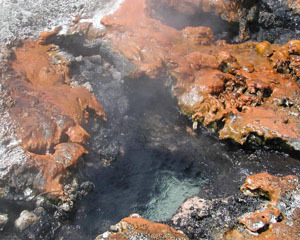 Second, that red Chloroflexi are present in and dispersed by geothermal spring water. In the second phase this project will assess RLMO population diversity (with an emphasis on red GNS diversity) at four established Yellowstone RLMO over four years. To achieve this, we are monitoring the chemistry and microbial content of spring water at three well-characterized red layer sites. All data are being archived on our on-line database. Since 2000, this project has been funded by the National Science Foundation's Microbial Observatory Program. Thus, these red layer sites are part of what is called the "Red Layer Microbial Observatory." Given that this funding specifically supports our "Research at Undergraduate Institutes" program (another NSF designation), we serve hundreds of undergraduates, pre-college students, and teachers each year with research-driven coursework, workshops, and summer field and lab experiences. Integral methods to be employed for these studies include denaturing gradient gel electrophoresis (DGGE) and in situ PCR. This project will further assess RLMO chemistry using a broad battery of spectrophotometric tests, the goal being to analyze GNS diversity as a function of site geochemistry, both of which are hypothesized to change over time. Red layer at the Fairy thermal site. Understanding the origin of photosynthesis and life itself are fundamental, interesting, and important aims of this work. There is great fascination in the notion that photosynthetic pigments may have originally evolved to harness heat first—then light. Red Chloroflexi are one of an emerging handful of phototrophs that use pigments capable of capturing infrared wavelengths of energy (i.e. heat). Although many scientists argue that the first living things likely used inorganic chemicals as an energy source(i.e. they were lithotrophs), there is also a hypothesis that the first living organisms may have used heat and then light in the same capacity.